The Austin Canons of Carlisle found that their church sometimes felt very overcrowded by ecclesiastic types in vestments with diverse official roles and an eye on the coffers. Henry I granted landed in Carlisle in 1102 for the foundation of a priory in Carlisle. It was funded by four churches in Northumberland as well as the wealth of Walter the Priest who endowed the priory with all his lands when he entered holy orders. Slowly other landowners began to make endowments and with the continued support of the king the Austin Canons continued to build their home. It was completed by 1130. They had three years in which to enjoy sole ownership of their new home. The foundation of the bishopric within the priory church of St Mary in 1133 meant that the priory church now became a cathedral. The first Bishop of Carlisle, Adelulf had previously been the prior of Nostell Priory near Wakefield. He tried to ensure that the revenues of the monks and the bishop were kept separate. At a conclave in Drax he sent a messenger to ensure that it was clearly understood that what the monks did was one thing but that what the bishop might do was entirely separate on account of the bishop having a role more like a parent within the ecclesiastic community. Just to add a drop of confusion to the discussion – rather like adding an extra thread to a ball of wool that already has its share of tangles – the Commons of Carlisle referred to the priory as the abbey but there was never an abbot appointed to be subordinate to the bishop. The bishop’s supremacy over his cathedral church cannot be questioned. It has been already pointed out that the bishop and his chapter formed one ecclesiastical corporation and held the lands and spiritual possessions of the church of Carlisle in common. When a division of the property was made and the see became an institution in some measure separate from the priory, care was taken to define the relationship of the head of the diocese to the corporate body occupying the church which represented the unity of his diocese and contained the seat of his jurisdiction. There is little doubt that at the outset the appointment of the prior was in the patronage of the bishop, and perhaps of the king when the bishopric was void. When the terms of the arrangement for the separate endowment of the see were complete, this privilege seems to have been relinquished to the chapter in compensation for the redistribution of emoluments. At all events it was not until 1248 that the canons had the liberty of electing their own superior. On 25 November in that year, Pope Innocent IV. granted protection and confirmation of possessions to the prior and convent, and especially the chapelry of the church of Carlisle, with all offerings, tithes, and parish rights belonging to the said church, except the offering at Whitsuntide, all the land formerly belonging to Walter the priest, which King Henry gave and confirmed by his charter, and other possessions. The pope also granted to the canons the right of electing the prior and prohibited the bishop from disposing of their emoluments without their consent. Clearly the monks had sound business heads on their ecclesiastical shoulders but they weren’t the only ones. The bishop maintained some control over the Austin Canons. He had a say in the selection of the sub-prior and cellarer, the two principal officers of the house. And things didn’t always go smoothly Prior Adam de Warthwyk received a stern lecture from Bishop Halton and later on Prior John de Kirkby was excommunicated by Bishop Ross which puts a whole new meaning on being sacked! Some priors even resigned their posts and perhaps it’s not surprising since the bishop had the power to carry out a visitation. Given the canons’ church was the bishop’s cathedral it is easy to imagine some of the petty grievances and slights that resulted in the full weight of the Churches authority being bought down on the monks. Prior Warthwyk was charged with negligence and remissness in the discipline of his house contrary to the statutes of the order. His household was much too expensive, he only consulted with Brothers Robert Karlile, William de Hautwysil, and William de Melburne, order was not preserved among the brethren, the business of the house was not transacted, and its goods were wasted beyond measure by his expensive entourage; the list- or rather rant- went on at some length. Quite what the Bishop would have made of the canons being allowed to wear hats on account of the cold is a matter of historical speculation. In 1258 Pope Alexander IV- the Borgia Pope- permitted the Canons of Carlisle to where caps in the choir on account of the northern cold. How this concern for monastic pates occurred is not a matter of the historical record but its nice to know that while Alexander was busy poisoning people, fighting wars, keeping bees and dallying with mistresses – though possibly not in that order- (yes- I’ve watched the series) that he had time to carry out his pastoral responsibilities for the Austin Canons of Carlisle. 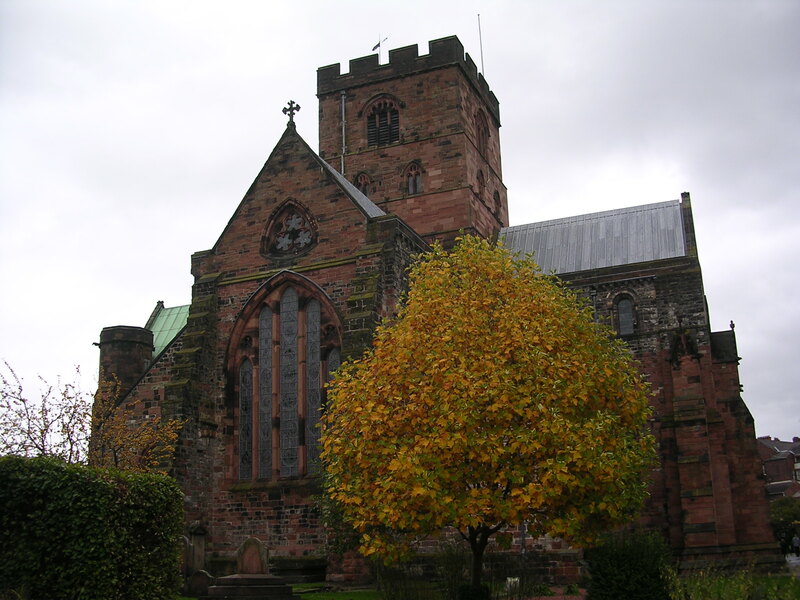 As well as being the priory church and the cathedral, it also served as the parish church of St. Mary, Carlisle, from the date of its foundation. Once again finances became an issue when the problem of endowing a dedicated vicar arose. The citizens of Carlisle made a complaint that the sacrist of the priory, to whom the issues of the parish were committed, had neglected the cure of souls and that insufficient ministrations were supplied to the people. The Bishop of Carlisle gave judgment in favour of the priory, because he said that the canons were able to serve the church through their own chaplains under the care and direction of the prior. No one mentioned the fact that the bishop may have lost some of his revenue and powers had a third ecclesiastic been appointed to the aisles of St Mary’s. The smallest cathedral in England was once larger than it is now but its choir and chapels must have echoed with the hiss of political intrigue and the sound of ruffled feathers – though of course at least the monks had warm heads. This entry was posted in Carlisle, Cathedrals, Monasteries and tagged Adelulf, Bishop of Carlisle, Bishop Ross, Carlisle cathedral, Carlisle priory, Henry I, Pope Alexander IV, Prior Warthwyk, St Mary's Church Carlisle by JuliaH. Bookmark the permalink.